Kangra paintings produced by a new generation of artists from the Kangra valley in Himachal Pradesh are being exhibited in Mcleodganj by the Kangra Arts Promotion Society in collaboration with the Department of Language Art and Culture. The exhibition is being inaugurated by Smt. 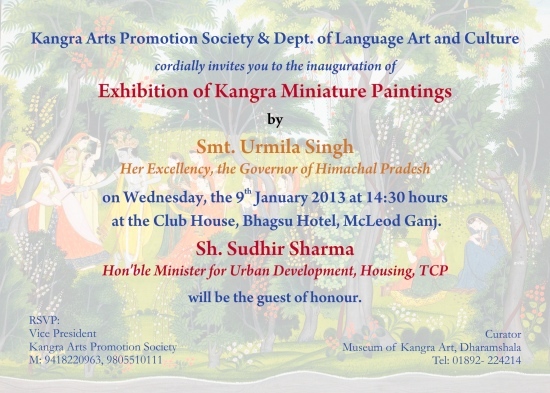 Urmila Singh, Her Excellency, the Governor of Himachal Pradesh, on 9th of January, 2013, at 14:30 hours at the Club House, Bhagsu Hotel. Sh. Sudhir Sharma, Hon’ble Minister for Urban Development, Housing, TCP, will be the guest of honour for the exhibition. The exhibition features paintings produced by students at the Chitera School run by the ‘Kangra Arts Promotion Society’ (KAPS) in Himachal Pradesh. KAPS is a not for profit Society working towards promoting Kangra Art and working to create a new generation of artists of this Pahari miniature painting style. The traditional Kangra Paintings represent one of the finest miniature painting styles from India. The distinctive feature of this exhibition is that it features the work of a new generation of artists, which the Kangra Arts Promotion Society (KAPS) has been training in this traditional art form. Varun Rattan Singh, from KAPS informed that the society has been conducting such exhibitions at various places since past 3 years. Similar exhibitions were organised in Jaipur and London last year. KAPS believe the exhibition will generate interests among the people about an important part of Himachali culture.